What’s better than watching a movie outdoors, by the water in the cool night air? You guessed it! 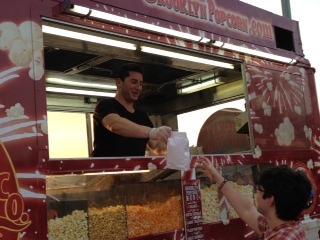 Brooklyn Popcorn had the pleasure of serving it up to movie-goers at Google’s Movie Night, June 25, 2013 in the NYC. 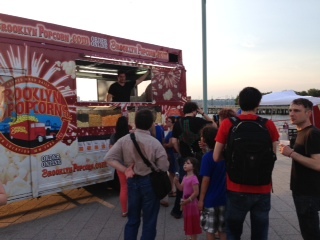 The weather was great, the view was even better and everyone enjoyed a cool movie with an opportunity to munch on some delicious, freshly popped gourmet goodies. There was an awesome bouncer for the kids, and other fun things to take part in as well. 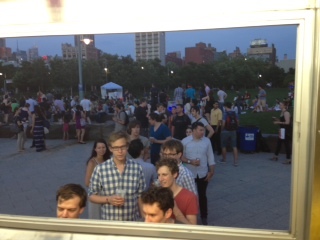 And we’ve got the pictures to prove it! Just check these out these cool pics with the out-of-this-world view, and we hope to see you soon so you can appease your taste buds too. Follow us on Twitter and Facebook to see where the truck is heading next. You never know, we may be coming soon to a street near you!